Discount Dumpster Rental Houston provides roll off service to the entire Houston metro area. Whether it be a residential project or a large commercial job, Discount Dumpster Rental Houston is able to provide the right size can for you. The quickest and easiest way to rent a roll off dumpster is to call our office. An experienced representative will walk you through the process of ordering a Houston Dumpster Rental. The 40 cubic yard dumpster is seen at large scale construction sites. Measuring 8 feet tall, this dumpster is large enough to handle the bulkiest construction material. If you’re concerned about size, you can’t go wrong with the 40. 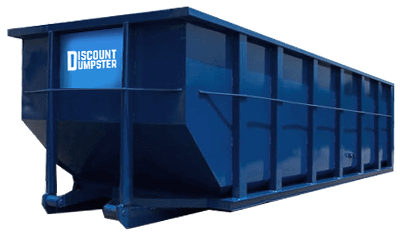 Discount Dumpster Rental Houston works hard to make sure your dumpster rental experience is easy and seemless. We create a fast, friendly, and reliable service so that you worry about the project at hand. Not about your Houston dumpster rental. By keeping the planet in mind Discount Dumpster allows you to feel confident in knowing your waste and recycling needs are taken care of. With our many locations and strong Houston dumpster rental presence, we’re able to offer our customers the most competitive prices for their trash and junk hauling needs. We take our operations very seriously, so those low prices come with outstanding customer service and punctual delivery that exceeds your expectations. Do I need a permit when ordering a Dumpster? In order to avoid the need of a permit it is best to place the container on private property. When placing a bin on your driveway there is no need to pull a combustible waste storage permit. If you have no other options a commercial dumpster permit may be pulled from the solid waste management department of Houston. An application form must be pulled and then notarized. In addition there are also specific fees that apply for the size and amount of days the container will be onsite. This process is takes 1-2 weeks so be sure to plan ahead. You must mail in the application along with the notarized affidavit, and payment to the City of Houston. What can be thrown away into a dumpster? The Discount Dumpster staff can help you decide just what size dumpster rental will best fit your needs. Give us a call and tell us about your project and we can make a recommendation for the best dumpster for you. Discount Dumpster makes choosing a dumpster size easy by comparing different container sizes in terms of pickup truck load equivalency. For example, six standard size pickup truck loads worth of waste would fit in a 15-yard dumpster. That’s generally a good size to choose when cleaning out the garage or a home of miscellaneous accumulated things or when doing a minor home improvements. If you are considering a remodel and going to be tearing out old cabinets and/or flooring, you may need a 20-yard container or larger, depending upon the size area you’re working on. Feel free call us up and ask any question you have! We will help steer you in the right direction. At Discount Dumpster in Houston, we are familiar with city requirements for placement of a temporary dumpster. In most cases, you’ll only need a permit if you want to place the dumpster on a street or other public area. Typically, we recommend placing your rented dumpster on private property to avoid dealing with any necessary permits. However, if you do need a permit, we will make the process simple for you. All we need to know is just what you need the dumpster for and the approximate amount of time you will want to use it. We can take care of all the legwork for you!